Differences in cell yield among patient samples can negatively affect the quality of chromosome and FISH slides. Lacking an analytical method, lab technicians normally look at the cell suspension in the tube and guess at an amount of fix to add. 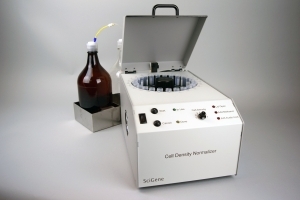 The Cell Density Normalizer is the first instrument specifically designed to quickly determine and precisely adjust cell density. 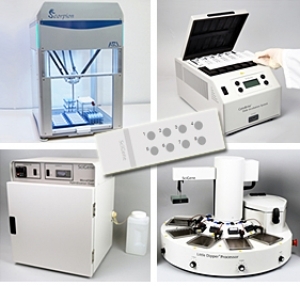 The operator simply inserts up to 24 commonly-used 15 ml conical tubes of cell pellets in the carousel and presses start. 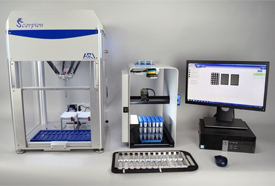 Pellets are automatically resuspended in a small amount of fresh fix, then rotated through an optical sensor to calculate and add fix to achieve the selected cell density. Tubes are then removed, capped and mixed end over end before use. Normalization of 24 tubes is completed in under 10 minutes.